The MSI 815E Pro is one of the few i815 boards you'll see with an optional ISA slot. You give up one PCI slot for that feature, and probably pay a bit more due to the required PCI-ISA bridge chip, but if you need it, the 815E Pro is probably your best option. 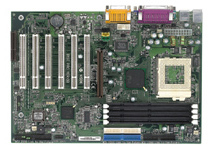 Our evaluation sample did not include this optional ISA slot, but rather went with the 6 PCI configuration that will be most common in the market. MSI has equipped the 815E Pro with all their usual features, including D-LED, which is now located in front of the PCI slots so that it's easier to see with the case open. Then they made sure to include a full suite of expansion options, including 6 full length PCI slots and 4 DIMM slots. As we've noted previously, the i82815 GMCH only supports 6 rows of memory, so if you want to use all 4 DIMM slots, two of the DIMM's must be single sided. While this may potentially confuse some people and cause a couple headaches, it does offer additional memory expansion flexibility. Once again, we found that 3 DIMM's were not stable at 133 MHz. The MSI did, however, have no problems with CAS 2 DIMM's, unlike some other boards in this roundup. Other than these configurations, the 815E Pro was rock solid in all our testing. Once again, we see a mostly jumperless CPU configuration, with a pair of jumpers to override the default FSB setting. This allows overclocking a 100 MHz CPU to 133 MHz or above speeds (or a 66 to >100 MHz, etc.). We'd really like to see MSI make this fully jumperless, but as it stands, it's little more than a minor annoyance when tweaking your system. Based on the speed detected from the CPU (or these jumpers), a certain range of FSB speeds is available in the BIOS, with the AGP ratio automatically set. To aid in those overclocking attempts, the 815E Pro has FSB speeds from 66 - 166 MHz in 1 MHz steps, CPU Vcore adjustments, DRAM voltage (3.3 - 3.6V in 0.1V steps), and a separate control for the memory frequency. To top it off, the 815E Pro also accepts the oversized FC-PGA-C heatsinks that are required on 1 GHz and above FC-PGA CPU's.